ANN ARBOR, Mich. — With every breath you take, microbes have a chance of making it into your lungs. But what happens when they get there? And why do dangerous lung infections like pneumonia happen in some people, but not others? Researchers at the University of Michigan Medical School have started to answer these questions by studying the microbiome of the lungs – the community of microscopic organisms that are in constant contact with our respiratory system. By studying these bacterial communities, and how they change in illness, they hope to pave the way for new ways to prevent and fight lung infections in patients. In new findings reported in recent weeks, the U-M team has shown that a nasty “feedback loop” could explain the explosive onset of bacterial lung infections: The growth of certain bacteria is accelerated by the very molecules that our body’s cells make as distress signals. The study, published in the American Journal of Respiratory and Critical Care Medicine, was the first to ask how levels of these “distress signals” relate to bacterial communities in the lungs. These stress molecules, called catecholamines (such as adrenaline), together make up one of the body’s primary ways of responding to stress or injury. Previous laboratory studies have found that some bacteria grow faster when exposed to these molecules, but no human or animal study has determined if they are related to changes in the respiratory microbiome. But research led by Dickson and U-M microbiologist Gary Huffnagle, Ph.D., continues to show that, though our lungs aren’t nearly as filled with microbes as our digestive tracts, the “ecosystem” of the lung microbiome is thriving and important. This model of the lung microbiome ecosystem, in both healthy and diseased lungs, was developed by U-M researchers. In another recent paper, published in the Annals of the American Thoracic Society, the U-M team asked how alike the bacterial communities in various areas of the lungs are in healthy individuals. The work sprang from an observation in patients with advanced lung disease: the bacterial communities found in one region of a patient’s lungs can look entirely different from communities found elsewhere in the lungs of the same patient. So the team, led by Jeffrey Curtis, M.D., obtained specimens of lung bacterial communities from multiple sites in the lungs of 15 healthy research volunteers. They studied them in detail using advanced genetic sequencing that makes it possible to see the relative numbers of different microbes in the population of a particular area. They found that healthy people have relatively uniform bacterial populations throughout their lungs, and the microbiome differs much more from person to person than within a single person’s lungs. 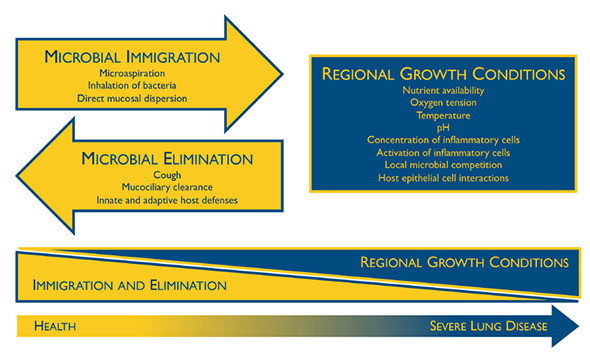 These findings support the “adapted island model” that the U-M team has developed to explain how the lung microbiome is populated in healthy individuals. In this model, the lungs are constantly seeded by bacteria from the “source community” of the mouth, just as islands are seeded by immigration of species from nearby continents. But in people with damaged lungs – such as those with cystic fibrosis or chronic obstructive pulmonary disease – the ecosystem is much more hospitable for bacteria. The lungs and airways become more like a tropical rainforest, rich in food and nutrients, where certain bacteria can thrive and reproduce – more like Madagascar than Antarctica. In a paper last year in the Lancet, Dickson and Huffnagle reviewed what’s known about exacerbations – flare-ups of diseases such as asthma, CF, COPD and pulmonary fibrosis. In many cases, they conclude, these events can be linked to a disruption in the microbiome of the patient’s lungs – a state known as dysbiosis. Instead, argue Dickson and Huffnagle, exacerbations happen when the bacterial communities in a patient’s airways are disordered, which creates inflammation, which in turn further disorders the bacterial communities. This cycle of dysbiosis and inflammation is common across a number of chronic inflammatory lung diseases. The U-M team is launching a study that will sample the microbiome of critically ill patients, like those Dickson treats in the intensive care units at the U-M Health System. Many of these patients are at risk of sepsis or acute respiratory failure, or of infections with Clostridium difficile that take root after a patient has received antibiotics to treat infection. Care in the ICU also often includes treatment with epinephrine and norepinephrine – two of the catecholamines that the team showed are associated with collapse of the lung microbiome.